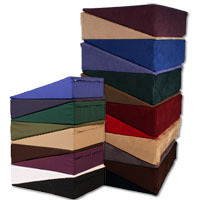 When you need the best in comfort and support, our suede memory foam chair pad is a reliable solution you are sure to love. This pad provides the comfort and relief of our other pads, with the added support of memory foam. There are several reasons to use memory foam for this type of item. Its shock-absorbing qualities benefit particularly sensitive users, and memory foam has proven to be effective padding material in bed sore prevention. This special foam ensures even weight distribution and continually adjusts to pressure as you change positions. The open-cell structure of our suede memory foam chair pad allows it to breathe, providing good air circulation and comfort. While the foam itself is soft and comforting, the suede cover is also worth noting. This cover is made from a soft material that is both comfortable and pleasing to the eye. We offer this product in multiple densities to help you get the right outcome for your needs. Whether looking for a softer or firmer density, we have you covered with this great solution. From the availability of sizes available to multiple color choices, this is an option you can tailor to your needs with ease. Discover a world of comfort today with this great addition! Please Contact Us with any questions regarding this product. We are always happy to help in any way.